The tofurkey is no more, the vegan green bean casserole is history, and not a crumb is left of the vegan pumpkin pie. Yes, the boy has come and gone, leaving little in his wake. The eggless, non-dairy pumpkin pie turned out great. It was a big hit, along with the vegan whipped topping I made with silken tofu, sugar, vanilla, and lemon juice. * Thanksgiving dinner was enjoyed by all. Alas, I cannot say the same for the Backyard Brawl. I know that Wait till next year! is the perennial cry of the loser, but Wait till next year! ‘Nuff said. 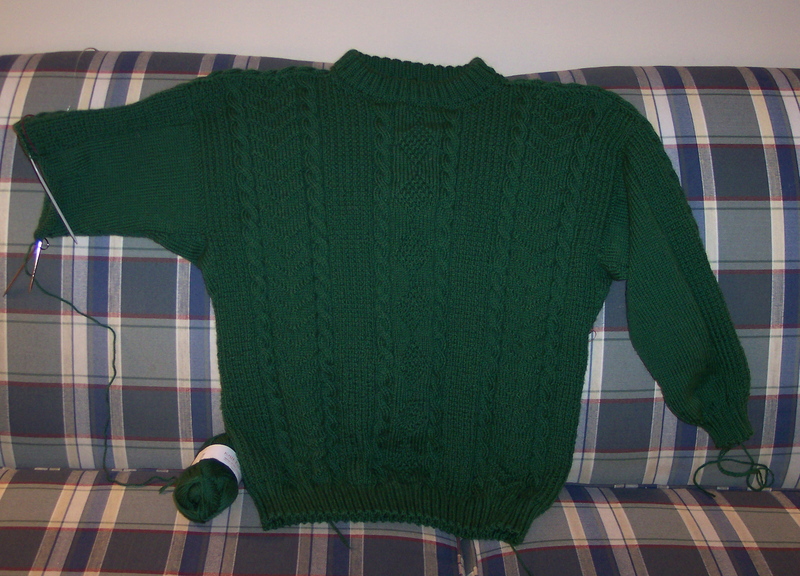 The Kelly green Traditional Gansey from Sabine Domnick’s book is nearly finished. I had the boy try it on and it fits quite well, but he thought there was a little too much bulk under the sleeve. So when I picked up the stitches for sleeve #2, I picked up eight fewer stitches to reduce the bulk a bit. Of course, that means ripping back and reknitting sleeve #1, but such is the way of knitting. Some people might think it is discouraging to have to rip out and reknit. But I am a process knitter; I don’t mind it most of the time. I’ve already put many hours into this sweater. If I’m going to invest my time and effort, then I want it to fit the recipient. So it is worth my while to rip out and reknit in order to make it fit properly. An improperly fitting sweater simply won’t get worn, and the proof of a sweater is in the wearing. I’ve been known to rip out a completed sweater because it didn’t fit. For the curious, the Gansey is knitted in Knit Picks Wool of the Andes in Grass. The boy picked out the color, and I was skeptical of his choice. It seemed to me to be a very bright green, and I wasn’t sure he would like a sweater in such a bright color. Boy, was I wrong. The color is simply gorgeous. And WotA has very good stitch definition, something I already knew from knitting my FLAK with WotA. It does tend to fuzz and pill when knitted in stocking stitch, but cables and textured knitting minimize that tendency. I think WotA is a good value: a decent yarn at a good price.